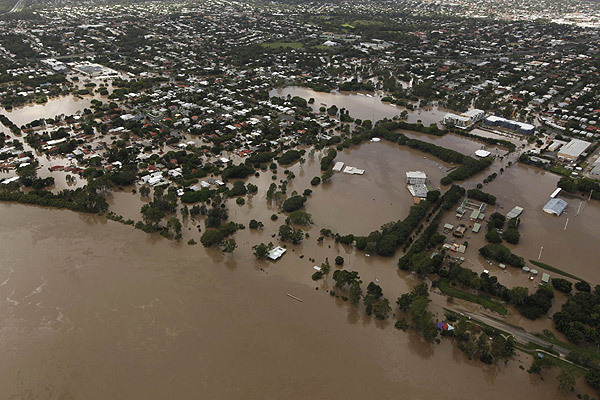 This post is not strictly related to the van but being a Queensland blog, I can’t neglect to mention the devastating floods that have affected much of the state in the last few weeks. And it does explain why progress on the van has stalled recently. It had rained almost non-stop since November, a trend which continued over Christmas (when we were overseas and facing our own weather dilemmas in the form of blizzards and dysfunctional airports) and, if anything, seemed to intensify in the new year. 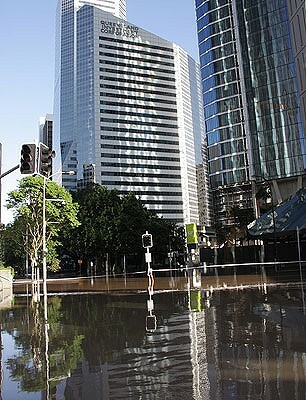 Brisbane rain can be fairly ferocious so we hardly even left the house some weekends. Last Monday there was flash flooding at the train station, and I had to roll my trousers up to wade to the platform. Suede pumps were not the best choice of footwear that day. And yet, despite this, we still had no inkling when we arrived at work last Tuesday that we’d be evacuated within a couple of hours. This is the wet season after all. 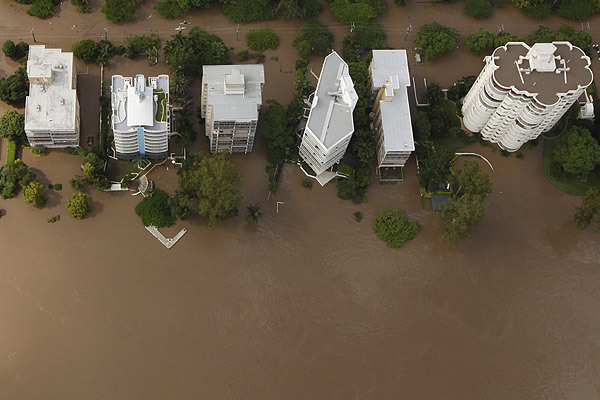 But our office block is opposite the Brisbane River, which was rising quickly and threatening to burst its bank that afternoon. It all suddenly felt quite dramatic as people crammed onto the usually empty 11am train out of the city to check their homes / round up cattle and, in many ways, to make the most of half a day off. Because I don’t think we realised at that stage how quickly it would escalate into something so prolonged and catastrophic. By the time I got home, most TV channels had constant news coverage – which then continued for several days. Thankfully we live well away from the river and at no risk of flooding. Of course, thousands of people living in the inner Brisbane suburbs and out west in Ipswich, Toowoomba and the Lockyer Valley were not so lucky. Sadly, there have so far been 20 deaths with more people still missing, and billions of dollars’ worth of damage. The enormous clean-up effort has now started and has seen thousands of volunteers turn out to help – the community spirit has been immense. Paul returned to work last Friday, but my office block is not due to reopen til 24th January due to extensive flooding around the electrics in the basement. Usually the prospect of two weeks off work would be fairly appealing, but it’s been a strange time. We registered for the volunteer effort straight away, but they have been so inundated (no pun intended) with people offering help, we haven’t been contacted yet. Living 30km outside the city also means we can’t just walk out with a mop and bucket and get stuck in (although I did drive into the city yesterday to try just this and felt a little conspicuous walking around a neighbourhood I didn’t know with my broom!) So we’ve offered support to friends where we can, and will turn out for the community clean-up day on Sunday. In the meantime, we’ve tried to stay cool (because the sun has finally appeared and it is roasting!) and keep busy at home. Somehow, just relaxing outside with a book hasn’t seemed right when people just down the road are still sweeping mud out of their homes, so, in sympathy I suppose, I’ve cleaned the house from top to bottom (I felt that should even include the oven), decluttered the wardrobes, sorted through 3 years worth of uni papers, had a cosmetics audit and a handbag amnesty and taken bags of stuff to Vinnies. It has been quite therapeutic. By next weekend, most people will have returned to work and I can justify tackling more ‘normal’ activities, like focusing back on the van. And maybe lying in the sun for ten minutes. 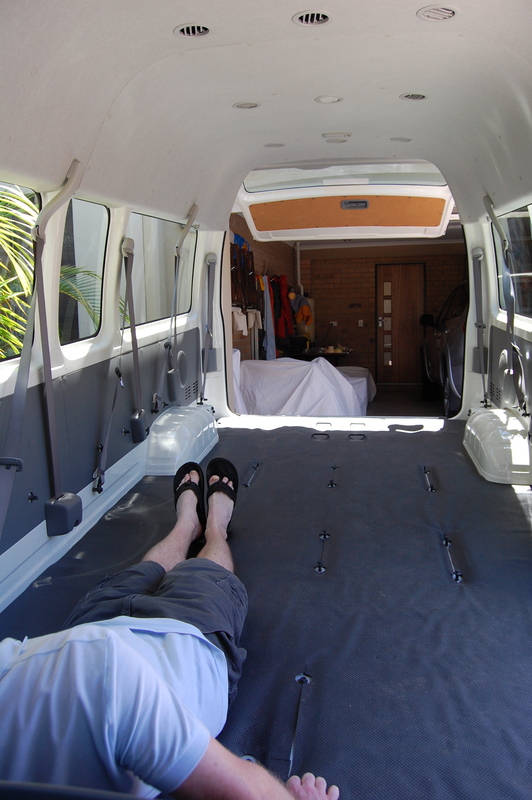 Buying the van – what happens next? 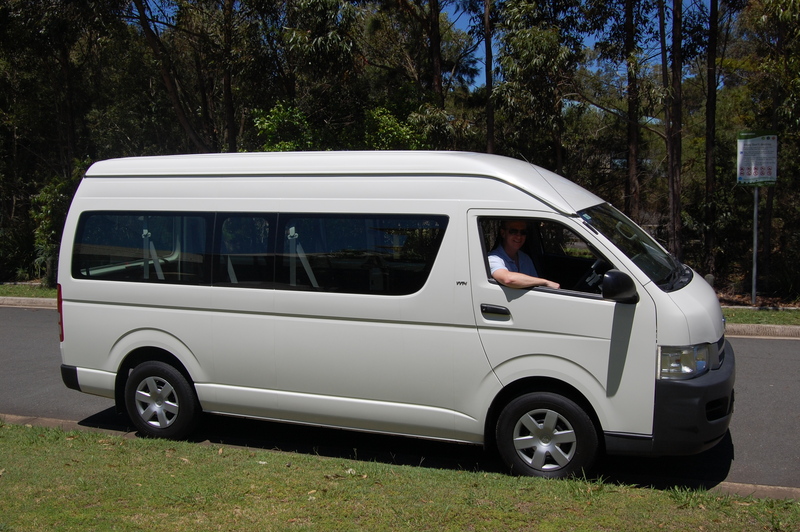 So after a seemingly endless, global search that saw us trek out to car yards as far away as Strathpine and Acacia Ridge, we’ve finally found the perfect van, hurrah!! 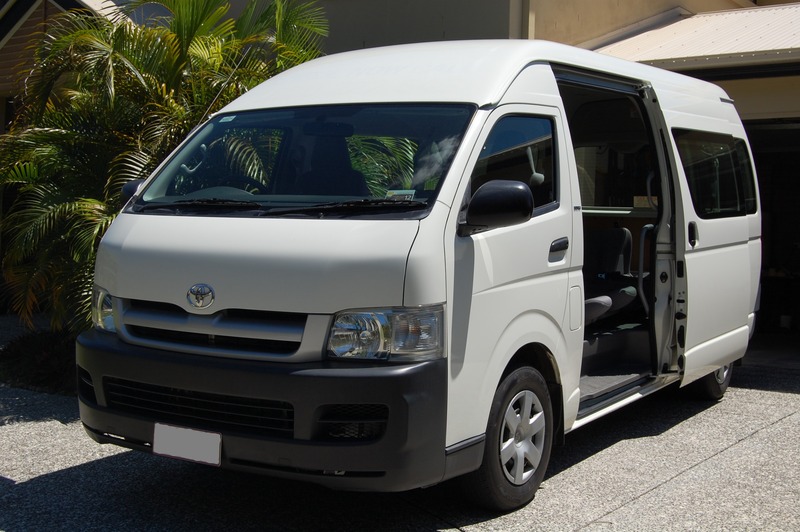 Paul had very precise requirements, and was starting to lose hope that there were any Toyota commuter vans in Queensland that represented exactly what he wanted (i.e. diesel, automatic, low mileage, low cost, no signage emblazoned on the side, one careful lady owner etc). 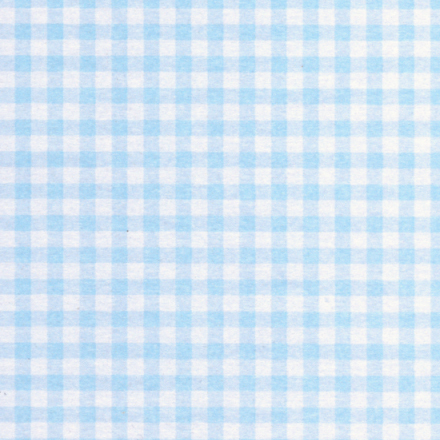 We had seen and discounted quite a few for various reasons, and unfortunately every salesman we encountered had the same reaction, exclaiming with a sharp intake of breath and a shake of the head that they were as ‘rare as hen’s teeth’. 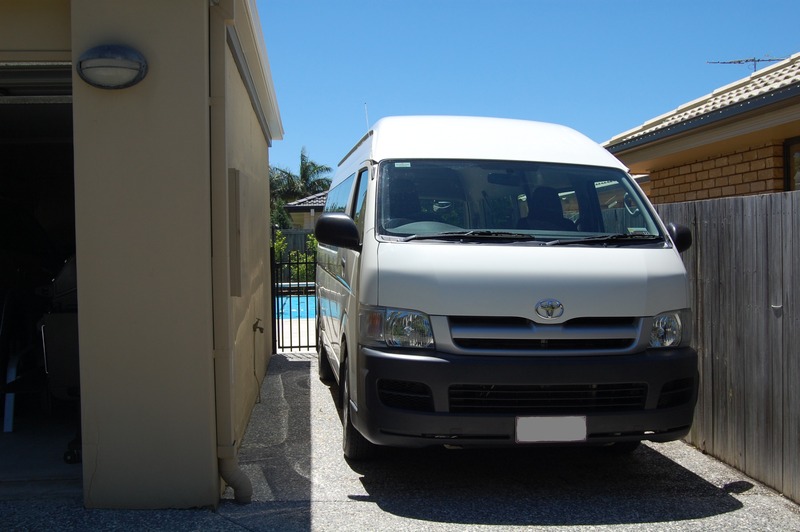 Not to be defeated, I logged on to carsales.com last Friday morning with the now ingrained list of requirements, and at the top of the list was a lovely looking van. It was petrol, not diesel, but other than that, it seemed exactly right. A 2006 model with only 41,000 km on the clock and best of all, it was $32,000 – $3,000 less than we thought we’d have to pay. It had somehow slipped through the cracks on Paul’s search, but he agreed it looked promising. That evening, Paul rang the contact number listed, and the guy said he had theoretically already ‘sold’ it to two people who were scrambling to arrange their finance, but if we could promise cash the following day, it was ours. Well. That was a turn up for the books. 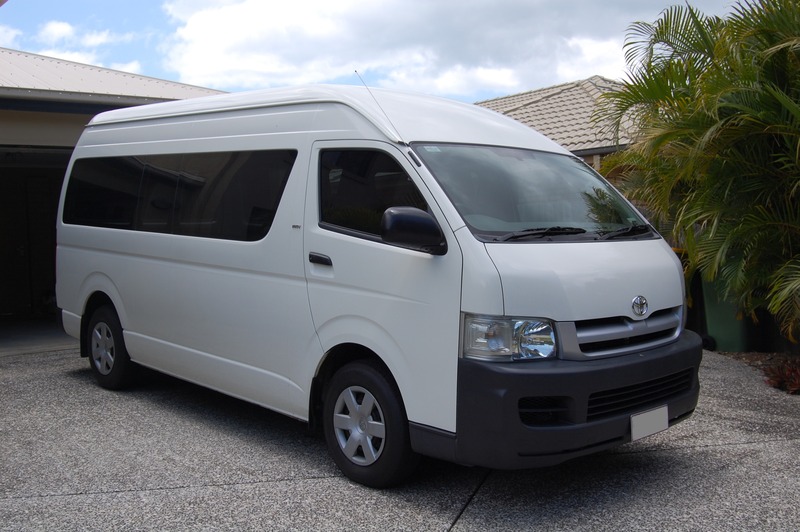 Keen not to be gazumped ourselves, on Saturday morning we drove in torrential rain to yet another interesting Brisbane suburb, Rocklea, where we met the owner in a printing & signage workshop where the van was being stored. It had recently come across from WA, where it was owned by ABC Childcare. 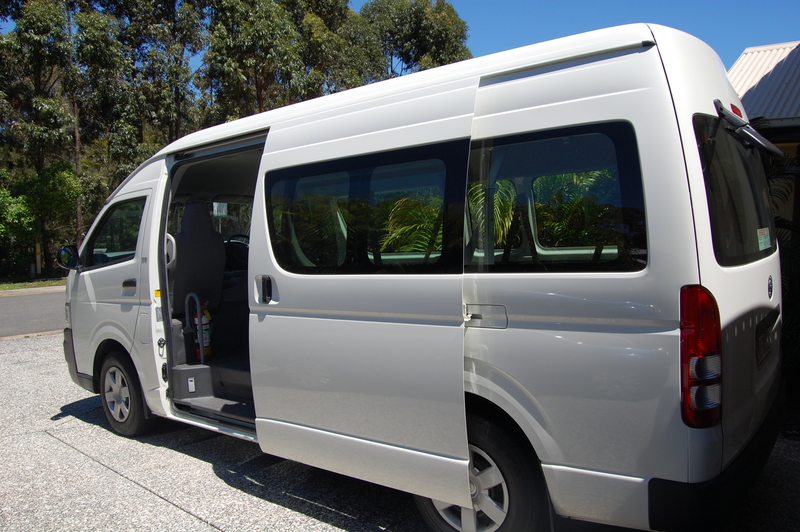 It wasn’t too good to be true, it was a beautiful van – clean and shiny with no dents and hardly any wear inside. It also came with a free fire extinguisher! We gave it a thorough test drive in the garage, and then dashed to the bank down the road for a cash deposit before he could sell it to anyone else. 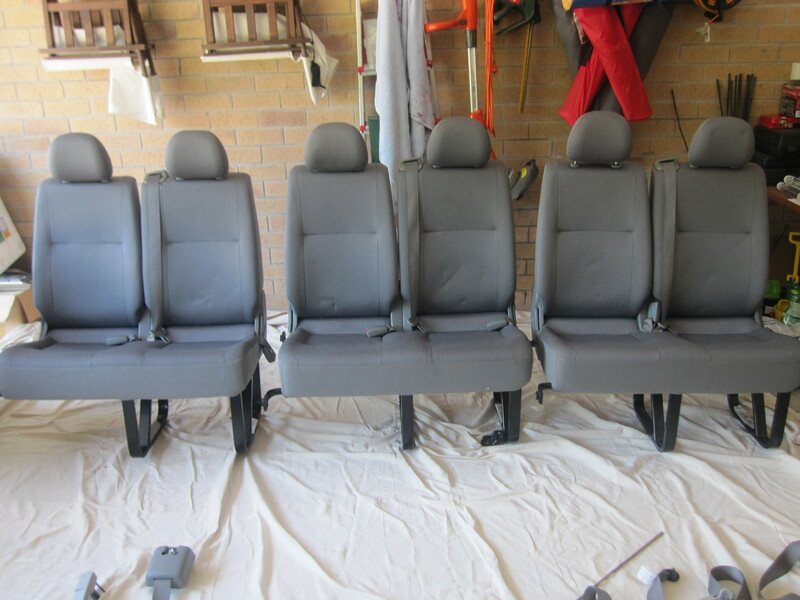 The owner was great, and promised to arrange for all 12 rear seats to be taken out, get it certified as a 2-seater vehicle and also re-register it in Queensland – all without charging any extra! 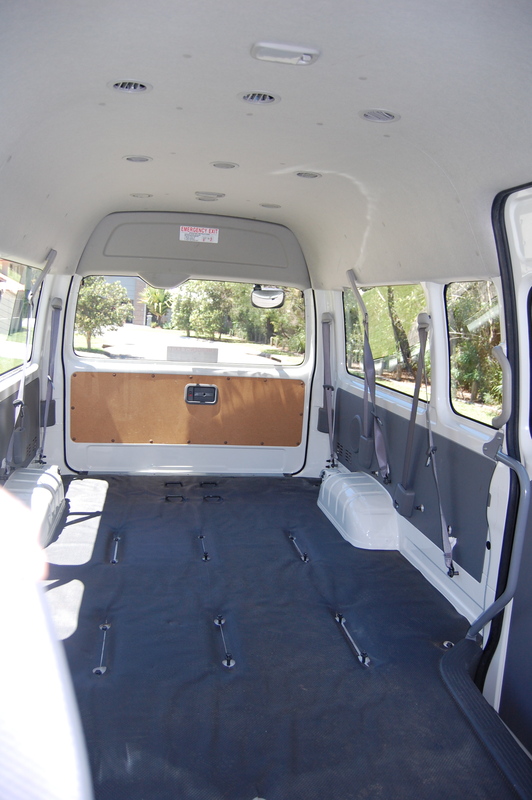 Paul drove back to Rocklea yesterday to transfer the rest of the money and drive the van home – sans 12 rear seats. Luckily it fits perfectly down the side of the house. So here it is: ooooh, aaaaah. In the afternoon we also joined 5,000 other people wearing this season’s pac-a-mac at the Brisbane Caravan and Camping Sale. It was good to check out the various fixtures and fittings, including lighting and sinks, that we can use in the van, although admittedly we spent most of our time swooning at the fantastic Winnebagos that slept about 16. Our van does not resemble a Winnebago. 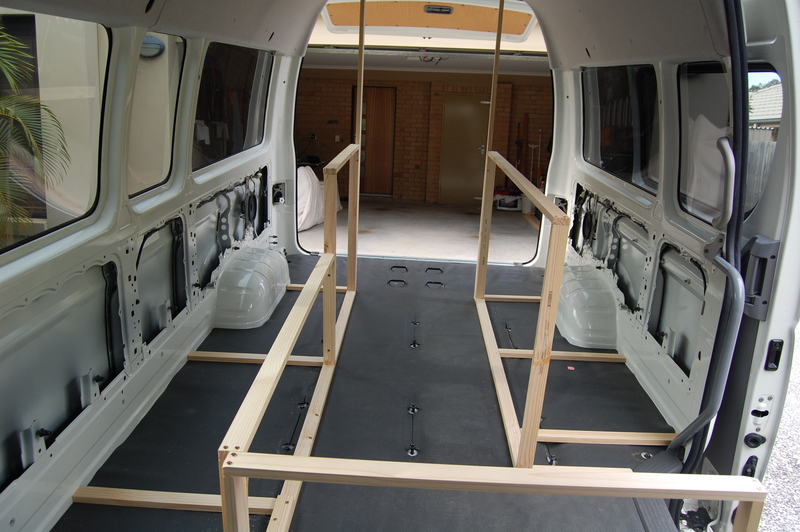 We found a conversion company who were helpful, and can do either the whole van or just the tricky bits. The look on Paul’s face suggested he would quite like someone to do the whole van, so we had to make a swift exit. At least we can get a quote for just doing the cutting work to install the gas bottle and ventilation. 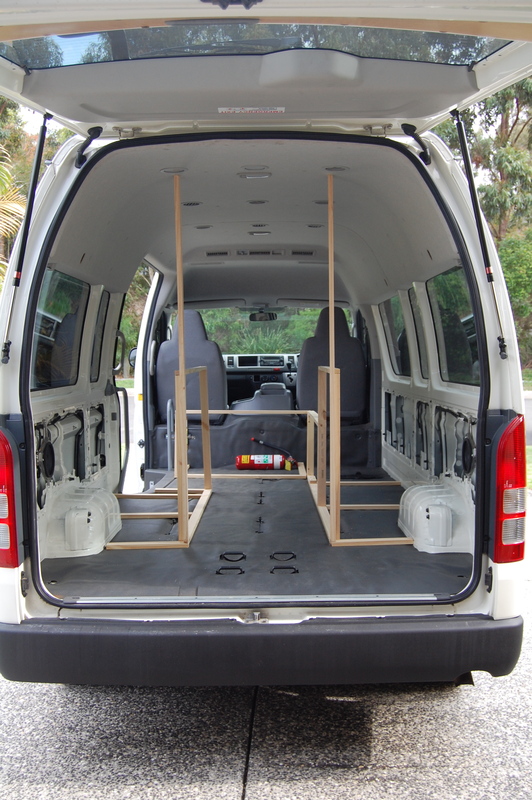 The only issue that keeps rearing its head is the height of the van inside. It’s 156m high, and because I’m 170cm and Paul is a bit taller, it means that spending any length of time standing or walking through induces a rather stiff back and neck. One option is to raise the roof an extra foot or so with either a hard or soft pop-top so we can freely move around, but Paul is not keen. Cutting the roof off would obviously be a major job, fairly expensive and not particularly one for the driveway. 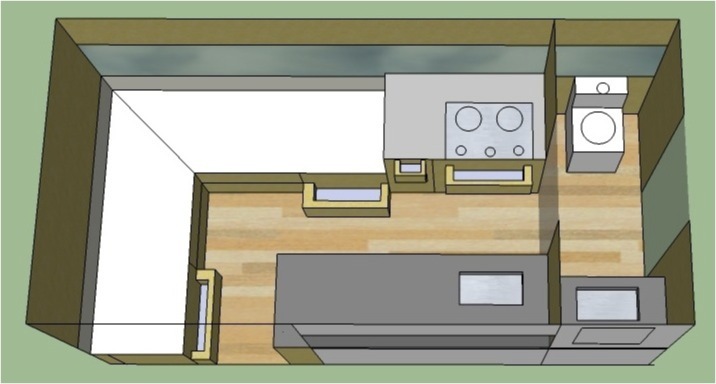 It would decrease the rigidity inside and make it hard to have an internal wall separating the bathroom (particularly with a soft-top), reduce fuel efficiency and limit the number of multi-storey car parks we could frequent. Of course, we won’t be spending long periods standing or walking inside however high the ceiling is. 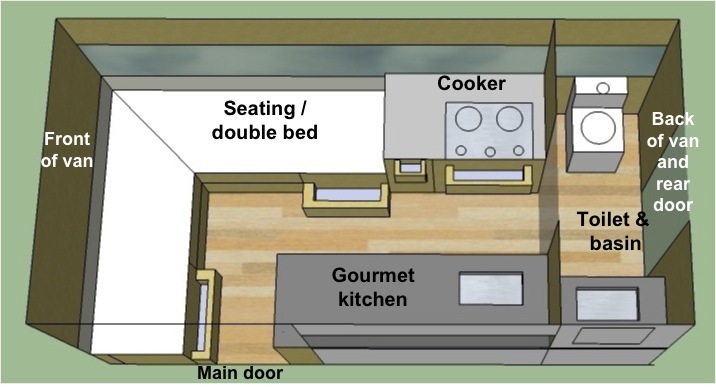 But it seems a shame to spend time building a lovely kitchen and bathroom if it’s then too uncomfortable to use them. Anyway, lots of people have tried to persuade Paul and he is having none of it – he says I can fry his breakfast kneeling down at the cooker. Hilarious. 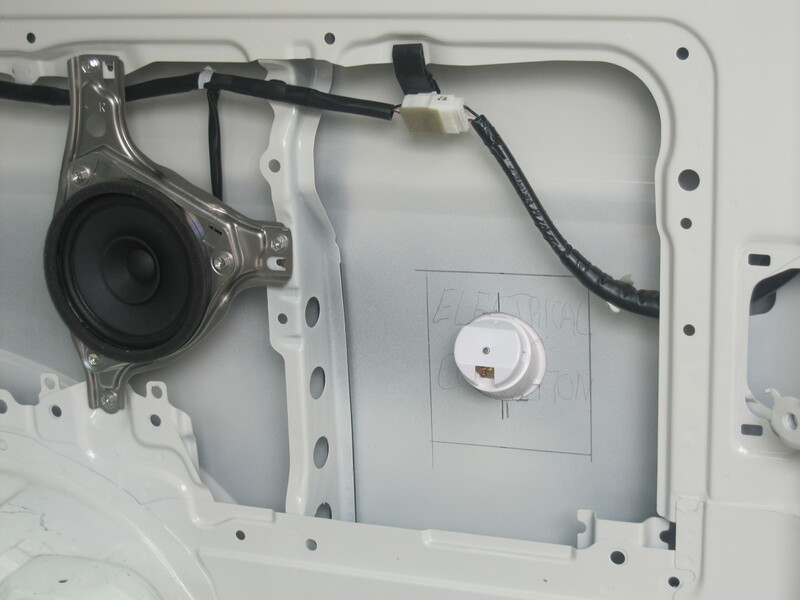 We’ve had no luck with the conversion company, who as it turned out were not interested in just doing part of the job. So Paul’s going to tackle it all himself – any excuse for another trip to Bunnings to buy some shiny new tools. He ordered a stainless steel box for the 9kg gas bottle, which arrived this week. 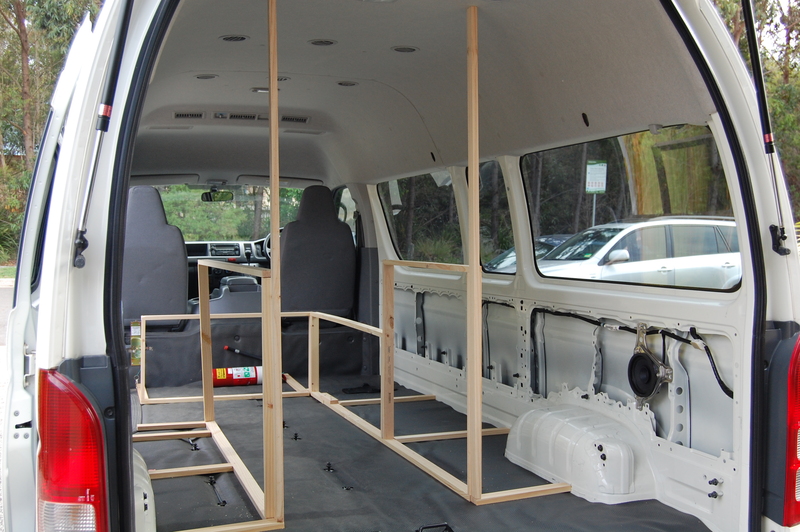 The plan was for it to sit underneath the seating bench but it’s a bit tall, and means when we put the seat cushion on top, the seat will be at window height. To avoid passers by getting a perfect view of our derrieres through the (albeit beautifully tinted) windows as we sit and enjoy our cups of tea, we might have to get a smaller gas bottle, that fits under the seats as we planned. A 2.5kg bottle should be fine just for weekends away anyway. 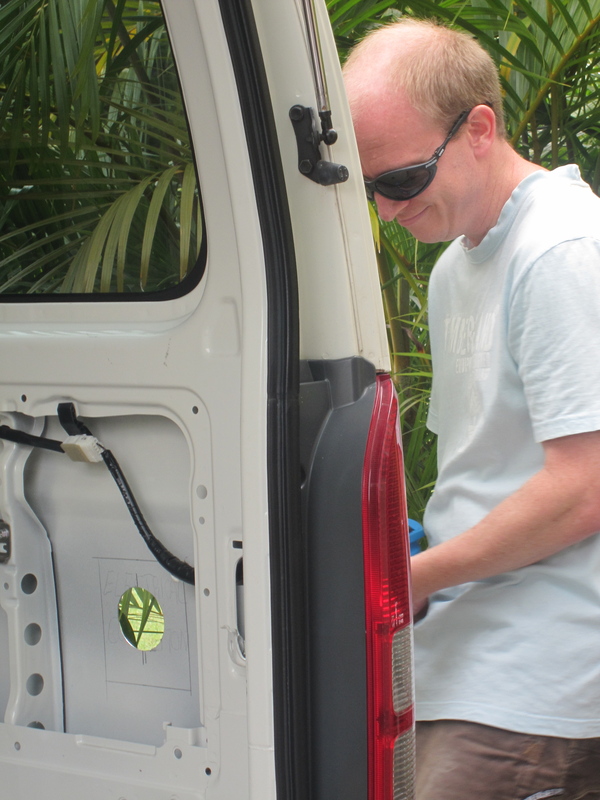 There were a few sweaty palms today, as Paul had to cut a nice round hole in the side of the van for the electrical power point. 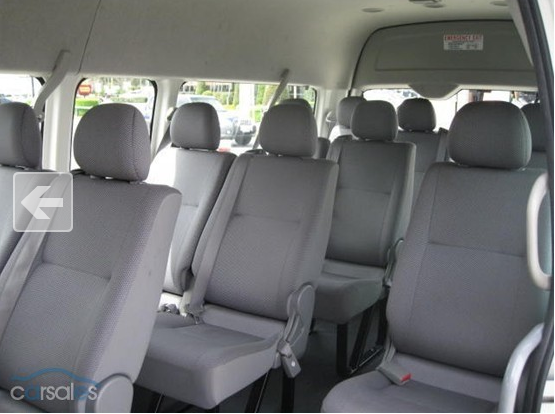 I can’t imagine there’s much demand for minibuses with portholes, so there’s no going back now!